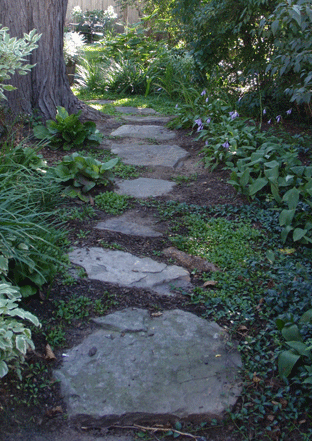 Susan Marsh Landscape Design plans, installs, and maintains gardens in the Belmont, Massachusetts area. Designing and maintaining gardens for over 12 years, Susan helps you establish a pleasing and maintainable garden, according to your ability and taste. She wants the garden to awaken your senses and beckon you outside for inspiration, reflection, and leisure. She looks carefully at your home and its architecture, and strengthens the connections between home and landscape. Her goal is to enhance indoor-outdoor life, and help give you and your family a greater connection to the natural world. A certified landscape designer, Susan is a graduate of Harvard University's Landscape Institute at the Arnold Arboretum. Her final studies involved the renovation of a public park and its environs. She continues to be interested in public spaces, their use, and their potential. Susan helps maintain the Woodland Garden at the Belmont Public Library and is a founding member of the Belmont Farmer's Market committee.